Man, I decided to try something similar for my “new” PC last year. Xeon X7550’s (4 of them). Half awesome, half horrible. Quickly you learn how many single threaded workloads you really have when you have 31 cores sitting idle, 1 core running maxed out, and your GPU is starving for data. I guess that’s partly why I haven’t bothered installing the E7-8870’s I snagged to upgrade it to 40 cores. Watching stuff like 7zip and ffmpeg make it totally worth it. My old machine could struggle transcoding 1080p video in real time, it was basically 80% speed rate. But 2 of these 6 core 2ghz chips are nearly up to 2x speed. I’m going to get the 4ghz 2011’s just because so many things are single core. Yep, 4-way is definitely not great for most workloads. Not much handles NUMA well, and then the hardware has an all or nothing reputation. Either the machine works brilliant for your workload, or it doesn’t. And when it doesn’t work at all there is a void of help out there. The first of these Dell R910 systems I built had a power failure which killed a PSU, but that tripped a “must contact dell for service” flag that normal mortals aren’t supposed to learn how to bypass. The vendor had no other option to give but ship me a replacement motherboard at their expense, and they didn’t want to get the dud back (who does board level repairs, even on a $$$$$ server?) Months later I found out which jumper to bridge for resetting the fault flags. Second one came with a memory riser that one of the heatsinks was shorting out the power rails, reset the flags and pull the faulty riser to get it back up and running. Now I’ve got the E7-8870s to toss in but I’m iffy on the risks. I’d be scared with E7’s as well. It’s why I like the E5’s as my ‘el-cheapo panic’ CPU set was $17 each with $6 shipping…. Otherwise those modern Xeons get expensive quick. NUMA is one of those things that feels far too much like NetWare 386 and trying to guess memory buffer sizes ahead of time for who knows what application. And then soldering it to the MB. I mean it’s cool and all but it’s like things can get real bad real quick, just like 4+ ways adding more doesn’t mean it’ll scale. 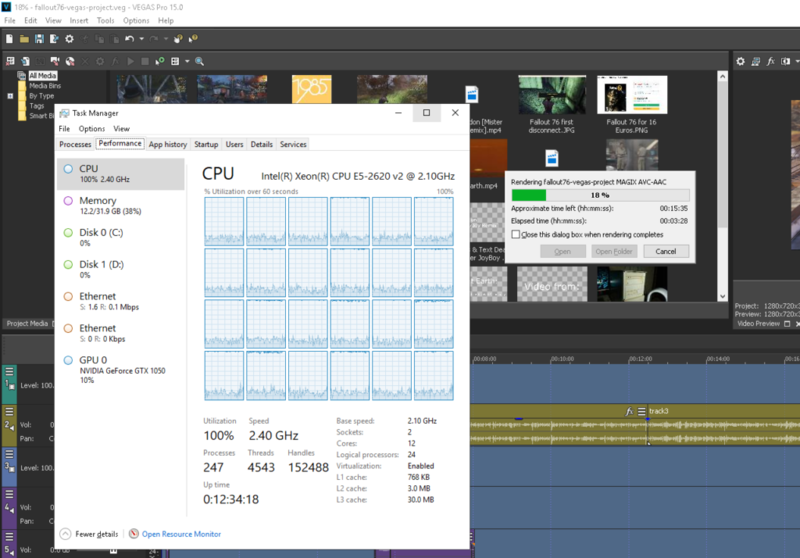 Turns out Sony Vegas Pro 15 works great multi-threaded so it pushes this thing 100% on all cores, real & hyperthreaded which is cool. I didn’t think that 10/2019 would matter much if it’s on Ivy Bridge based kit. I should add that these server Xeons idle at high speed, so they do draw a lot of power, if you are worried about power bills. At the same time using my a.out cross tool chain, I can build a 386BSD 0.1 pl24 kernel in 3-6 seconds with a ‘make -j 48’. It’s awesome.